Russian physician; born at Grodno 1853; died at St. Petersburg Feb. 14, 1901. After leaving the gymnasium at Grodno he studied in the St. Petersburg medical academy (1871-76). During the Turko-Russian war Schapiro served as a military surgeon, and after the war was assigned to duty in the military clinic of the medical academy. Then followed a long military service in St. Petersburg and Odessa, until he was appointed privat-docent of medicine in the imperial clinical institution for physicians (1895). In 1896 he was advanced to the position of senior assistant, and in 1897 was appointed to a professorship. 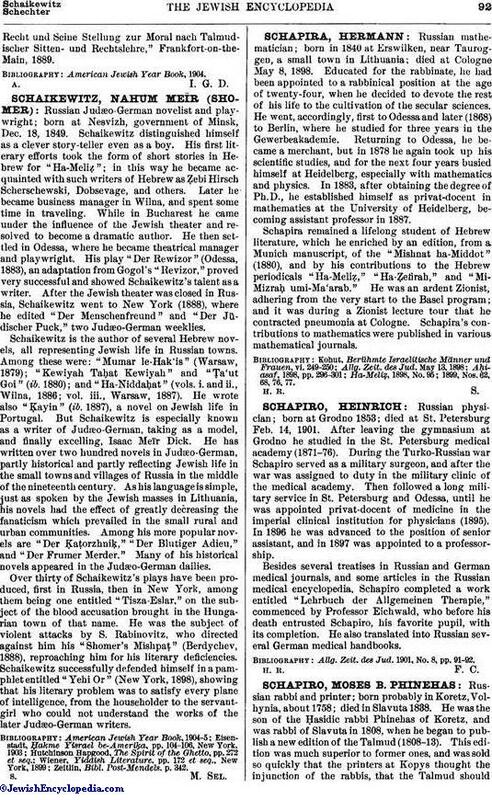 Besides several treatises in Russian and German medical journals, and some articles in the Russian medical encyclopedia, Schapiro completed a work entitled "Lehrbuch der Allgemeinen Therapie," commenced by Professor Eichwald, who before his death entrusted Schapiro, his favorite pupil, with its completion. He also translated into Russian several German medical handbooks. Allg. Zeit. des Jud. 1901, No. 8, pp. 91-92.